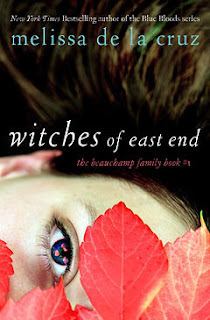 Melissa de la Cruz's new novel Witches of East End comes out tomorrow! I got the awesome chance to interview her and talk a bit about the book, and how the novel also ties into the Blue Bloods series. Check it out! 1. You’ve become a very widely known YA author, with the bestselling Blue Bloods series. Why did you decide to venture into Adult Fiction now? What are the major differences between your YA novels, and Witches of East End? I was on tour a couple of years ago and noticed that a lot of my fans were adults - or had grown up with the series and were now in college, or in their 20s, so I thought it might be fun to do a book that didn't have to be set in high school, that my fans would enjoy. I think the major difference is that the issues don't revolve around growing up, or finding your identity, in Witches of East End, the women know who they are, but adulthood comes with its own set of issues and heartbreak. 2. Who do you indentify more with out of your 3 leading ladies, Joanna, Ingrid, or Freya? Probably Ingrid. I worked in a library in college, steaming architectural blueprints, and I'm pretty uptight. There's definitely some of Freya in me as well, as I went through a wild child phase, and I very much relate to Joanna, in her thoughts about motherhood. But my voice is probably the closest to Ingrid's. 3. Witches of East End deals with Norse mythology, something new and not too common in most books today. Why did you pick it, as opposed to other mythologies, such as Greek, Roman, etc? Since I was a kid I'd been obsessed with Norse mythology, I think i was in fourth grade when I discovered a book that had all the Norse myths and I just loved it. I loved it because they were more obscure, they're the "cult favorite" of mythologies, maybe. And I loved the story of Loki and Baldur, and all the tragedy in them. Greek or Roman mythology didn't excite my imagination as much as the Norse stories did. And of course I loved Lord of the Rings, the Ring cycle by Wagner, and all those are based on Norse mythology so that all made sense to me. 4. The characters from your Blue Bloods series can be seen in Witches of East End, and vice versa. Was this always planned, or did you simply introduce Freya in Bloody Valentine, and then later on decide that she and her family had a great story to tell? Everything's been planned from the beginning, when I had the idea for Witches I was writing Misguided Angel, and I laid all the seeds in it for Bloody Valentine and Witches of East End. 5. Are there any songs that inspired you while writing Witches of East End, like a playlist that you listened to in order to set the mood? I was listening to a lot of old school rock and roll, Guns and Roses, Led Zeppelin, Rolling Stones, to get into the mood to write Freya's bar scenes. I spent a lot of my twenties dancing around in bars or when we'd have a party we'd blast music and everyone would dance -- somehow this goes away and you don't even notice it, that you have parties and no one dances anymore, which makes me sad. 6. Lastly, if you could describe the book in only 4 words, what would they be? Thank you so much to Melissa for answering my questions! I really like Witches of East End, as you can read in my review here . You're so lucky. Great interview. Can't wait to read this.